Only a few short years ago, West Nile virus (WNV) was a distant concern for United States health officials. However, in 1999, the deadly mosquito-borne virus struck the New York City area, with encephalitis (swelling of the brain) reported in humans and horses. Since then it has spread quickly and surfaced in all 48 continental states. The West Nile virus continues to pose a significant threat and can be fatal to both humans and horses. More than 1,050 horses were diagnosed with WNV in 2005 alone. Since 1999, when the virus was first recognized in the United States, more than 24,000 cases of WNV have been diagnosed in horses, with more than 7,000 of those resulting in death. During the same time period, more than 19 ,000 human cases of WNV have been reported to the Centers for Disease Control and Prevention, with more than 800 of those resulting in death. Fortunately, in the past few years the number of horses diagnosed with WNV has declined. This largely is due to proper management practices, including better vaccination regimens; but horse owners cannot become complacent about West Nile virus. West Nile virus never can be eradicated—there is no cure for WNV. Mosquitoes aren’t going away. Birds that serve as reservoirs for the disease aren’t going away. At least 30 species of mosquitoes have been found positive for WNV, and every day more disease-carrying bird species for mosquitoes to feed on are being identified. This is why, despite declining prevalence rates, horse owners are encouraged to remain vigilant against WNV. A sound vaccination program along with good environmental management practices, such as the elimination of standing water and use of mosquito repellent, provide the best means for controlling spread of the virus. West Nile virus was identified in horses relatively recently; it was first noted in Egypt and France in the early 1960s. Since then, veterinarians, epidemiologists and scientists worldwide have studied the virus to help understand the transmission cycle of the disease and its impact on humans and horses. West Nile is a mosquito-borne virus that can cause a range of clinical signs, from mild flu-like symptoms to encephalitis. Migratory birds are an important reservoir for WNV and have served as the major vector for spread of the virus into new areas. The virus is known to cycle between birds and mosquitoes, but a mosquito bite is the only way a horse can become infected. Mosquitoes have not demonstrated the ability to transmit the virus from an infected horse—that means horses, similar to humans, are “dead-end hosts.” Moreover, horses cannot infect other horses and humans. How can I decrease my horse’s risk? •Of the horses for which there was information, 50.2 percent had not been vaccinated. •Horses that were not vaccinated were 2.1 times as likely to die compared to horses that were vaccinated. If you are vaccinating your horse against WNV for the first time, there is one vaccine that requires only a single dose, while other WNV vaccines require a two-shot series spaced three to six weeks apart for primary immunization. With the two-shot series vaccines, your horse will not have developed an optimum immune response (may not be fully protected) until several days or weeks after the second dose. It is critical during this time period to protect your horse from insects with other means, such as mosquito repellant, reduced exposure and use of masks and fly sheets. 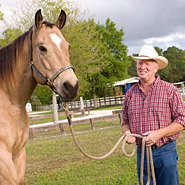 Horses that have been vaccinated in the past will need an annual booster shot. •Eliminate mosquito breeding areas: shallow, stagnant water and puddles. •Dispose of any water-holding containers, including discarded tires. •During mosquito season, pasture horses as far away as possible from large bodies of standing water such as ponds and lakes. •Keep horses stabled during dawn and dusk, when mosquitoes are most active. Remember, however, mosquitoes are attracted to lights and heat, so keep barn lights to a minimum at peak mosquito times. •Maintain use of horse insect repellent; look for a product that repels and kills. •Use masks and fly sheets for your horse. •Remove manure daily from paddocks, stalls, arenas and round pens. Manure is a breeding ground for many insects. For larger areas, breaking up the manure by dragging a chain or harrow will help accelerate the decomposition process. •Drain and clean your horse’s water trough regularly and add a few drops of mineral oil to the water. It is safe for horses but makes the water uninhabitable to mosquito larvae. However, the oil will kill fish. •Place large fans throughout the barn to keep air and insects moving. Is it too late to vaccinate? To ensure your horse is adequately protected, most veterinarians recommend vaccinating for WNV at least 2 to 4 weeks prior to mosquito season. But it’s August—mosquito season is here. You may be wondering, is it too late to vaccinate? What about spring foals or newly acquired horses with unknown vaccination history? Take heart. Recent advancements in equine vaccine science have resulted in exciting new vaccine technologies for veterinarians and horse owners. One such advancement is PreveNile West Nile Virus vaccine—the only one-dose West Nile virus vaccine available for primary immunization. Until now, veterinarians and horse owners have had only one choice when it comes to WNV vaccination: a two-dose regimen, administered 3 to 6 weeks apart, for primary immunization. Intervet’s new PreveNile vaccine is the first to come to market as a one-dose WNV vaccine for primary immunization. This means your horse is protected weeks sooner than with two-dose products, and it makes PreveNile the perfect choice for foals, horses with unknown vaccination history and as a booster for horses previously vaccinated with other West Nile vaccines. A single dose also means added convenience for both veterinarian and horse owner, less stress on the horse, and less chance for a post-vaccination adverse event such as an injection-site reaction. PreveNile is based on innovative chimera vaccine technology, which is the same technology being used to develop the first human WNV vaccine. PreveNile is proven safe. In field safety trials, PreveNile was 99.9 percent reaction-free when given to adult horses, pregnant mares, and in foals 4 months of age or older. Great scientific strides have been made in understanding and reducing the WNV risk to our equine companions. The fact remains, however, West Nile virus is here to stay; but vigilant horse owners like you have the power to fight its harmful effects. or visit www.intervetusa.com and www.PreveNile.com. PreveNile is a trademark of Intervet Inc. or an affiliate. © 2007 Intervet Inc. All rights reserved.